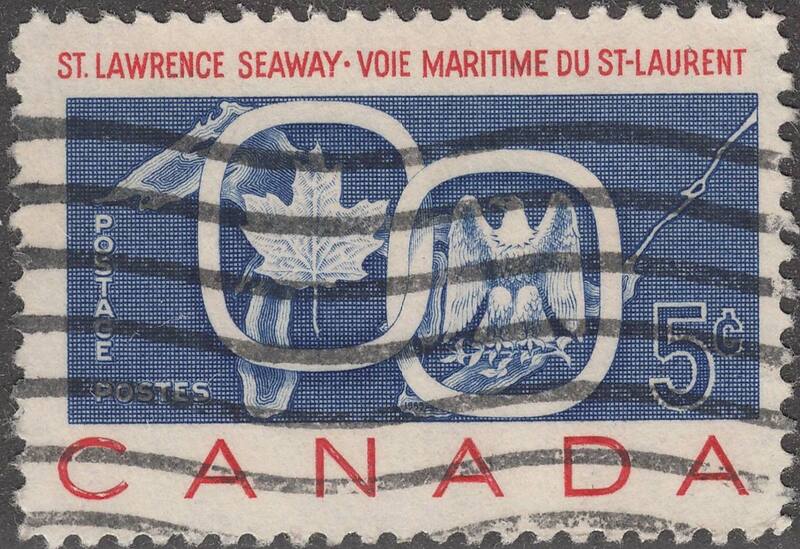 The value of a St. Lawrence Seaway - 5 cents 1959 stamp depends on several factors such as quality and wear, supply and demand, rarity, finish and more. Values in the section are based on the market, trends, auctions and recognized books, publications and catalogs. This section also includes information on errors and varieties and characteristics. Joint issue of Canada and the United States, the first occasion that these 2 countries have collaborated in such an issue. 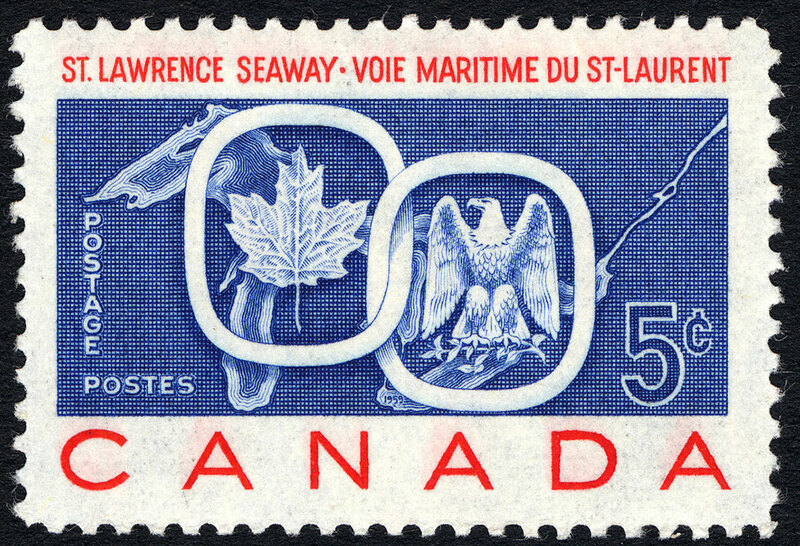 Postmaster General William Hamilton in releasing the stamps said: "The St. Lawrence Seaway is an outstanding example of what has been achieved through the friendly co-operation of Canada and the United States, each dedicated to peaceful advancement of all mankind. At a time when international trade is so vital to the people of the free world, our joint stamp issue salutes the opening of a new link in a vastly improved channel for such trade and a powerful source of hydro-electric energy for both our nations." United States Postmaster General Arthur E. Summerfield responded in a similar vein: "The joint issuance of these stamps by Canada and the United States is one more instance of the increasingly close relationships between our 2 nations. The St. Lawrence Seaway is a monument to the efforts of 2 sovereign nations and an outstanding example of international co- operation and good will. These beautiful new stamps worthily commemorate this great development which will mean so much to world trade and peace." Except for the necessary differences in captions and denominations, the stamps are identical in design, the result of the co-operative efforts of Canadian and American artists. The stamps are in the 5-cent denomination for Canada and the 4-cent denomination for the United States, being the respective rates for first class letter mail in each country. 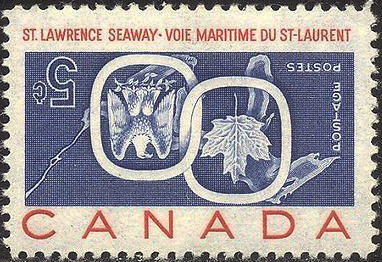 The Canadian stamp is bilingual with the heading "St. Lawrence Seaway Voie Maritime du ST. LAURENT," and the caption "Postage Postes" reproduced in both English and French. 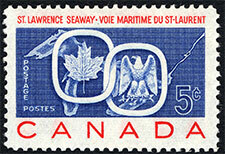 The United States version carries the caption "St. Lawrence Seaway" across the top of the stamp, "United States" across the bottom. The wording "Postage" is at the left and the denomination "4 cents" at the right. The stamps for both nations were printed in red and blue on white paper utilizing the national colours of red, white and blue for both countries. Both stamps have the Great Lakes connecting links of the design on a blue background with captions in red. Reproduced in white on both stamps are the emblems of both nations, maple leaf for Canada, and the eagle for the United States, enclosed in interlocking links superimposed over a background of the Great Lakes.